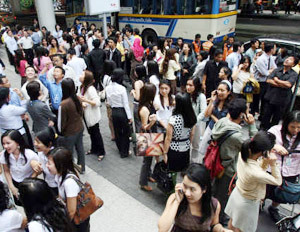 A strong earthquake measuring 6.1 on the Richter scale struck western Laos near the border with Thailand on Wednesday, causing mild panic among office workers in Bangkok. No casualties or damage were reported. Workers in high rises and hotels in central Bangkok poured into the street after the earthquake caused tall buildings to sway. “I have not seen a strong earthquake like this before, my head felt like it was spinning,” said Nattaya Limngern, a 40-year-old office worker in Bangkok. In Chiang Rai, the top of an ancient pagoda that was under restoration crumbled to the ground, a local official said. Meanwhile, 11 minor aftershocks occurred Wednesday night.